Run Trainer offers various training plans to get you started (5K, 10K) or to improve the experienced runner (15K, Half Marathon). But what if you are recovering from an injury or you already have a personal training plan to improve your speed or distance, specially designed for you? 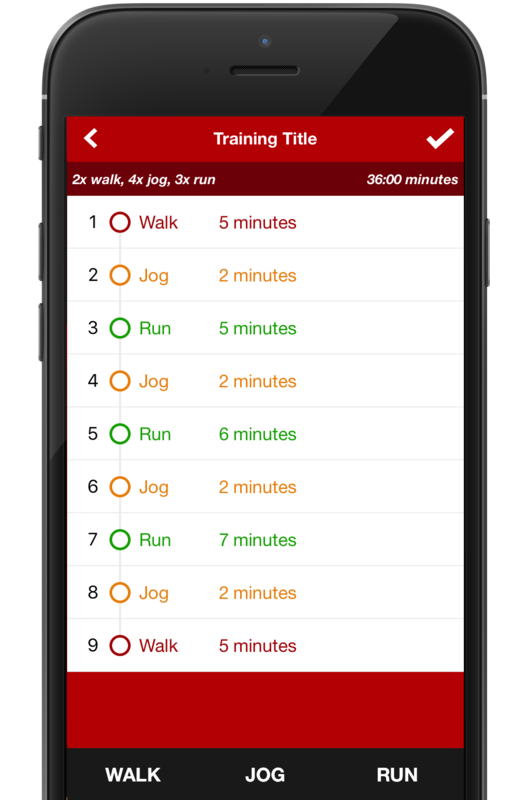 With the “My training plan” feature you can program your personal training plan in Run Trainer and get audio feedback during your training, all on your phone!. My Plan was specially created for helping you during your recovery or improve running for experienced runners even if you do not wish to use our programs. You’ll be able to setup multiple training sessions (up to 30 sessions) with different speeds (Walk, Run, Jog) and program the length of each step. When you tried it a few times creating a plan should only take 1 or 2 minutes. My Plan can be found in the Training Center of Run Trainer. Add a new training session (press the + button). You start with naming the training session, like “5K lesson 1” or “Knee recovery 1”. Submit all steps of the training session first, not the time yet. Like: Walk, Run, Jog, Run, Jog, Run. TIP: You can quickly see how many times a step was inserted in the training to keep track of it all.